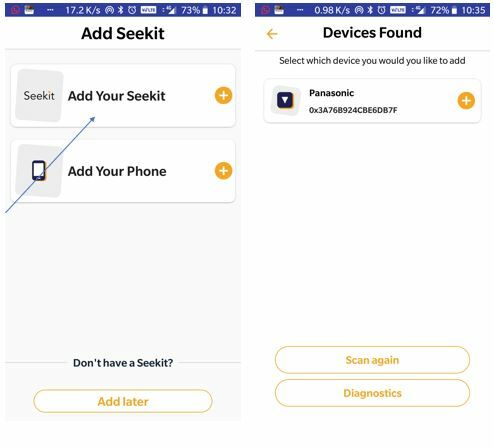 To track the valuable items, so you never lost them, the Panasonic has launched a special kind of nifty device called Seekit. 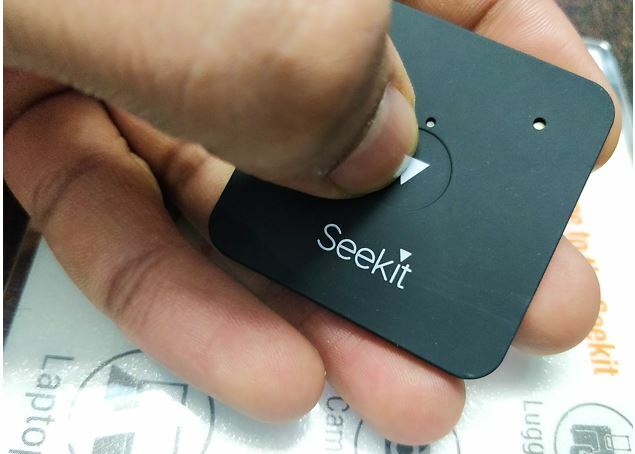 It is a portable tracking device that uses the phone’s Bluetooth to communicate with the Seekit app installed on a smartphone. It is a Bidirectional tracking device which gives voice alerts when the user gets away from its range of 100 feets. As I said bi-directional that means either the Seekit or Smartphone (with app) both can send alerts if they start getting apart from each other’s vicinity. If you forget your smartphone and you have the Seekit in your wallet or as a keychain, it will start producing voice alert; now assume another situation, let’s say you have a wallet or car keys tagged with Seekit and as soon as you start getting out of its range you will get a message alert on your smartphone. So, its kind of vice versa thing. It is has IP65 for protection from rains. Tracker is available in two variants — Seekit Edge and Loop and is priced at Rs 1,599 and Rs 1,299 respectively. 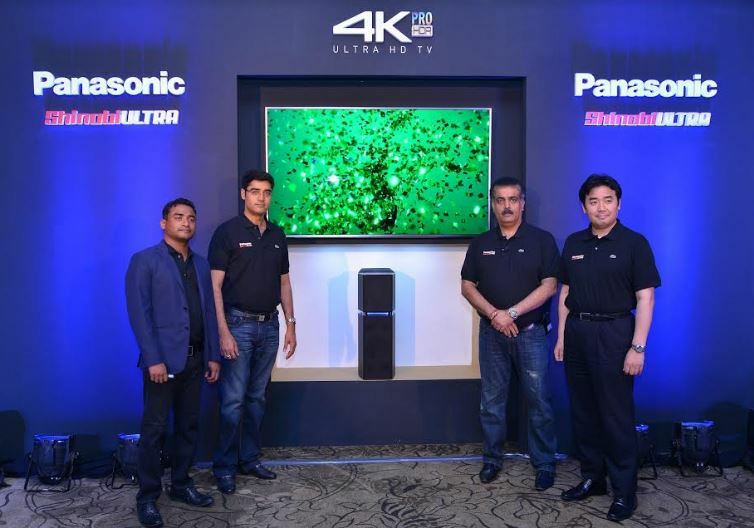 If you already have bought the Panasonic Seekit and looking want to use it then here is the hands-on article on that. 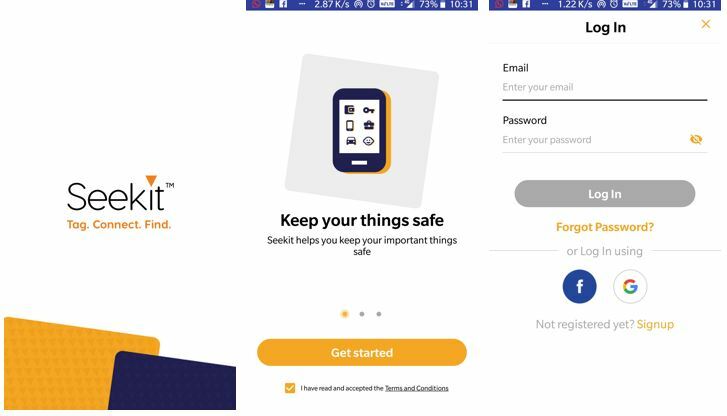 Step 1: First of all, you need to install the Seekit app on your smartphone. Step 2: Go to the Google Play Store (Android phone) or App store (iPhone or iPad; when available) and search Seekit, however, if you are an Android user here is the link. Step 3: Once the installation of the Seekit app has done. Open the app and create a Seekit user account. Step 4: You can sign up the app either by your email ID or directly by taping on the Google or Facebook accounts. Here we are using the Google account. 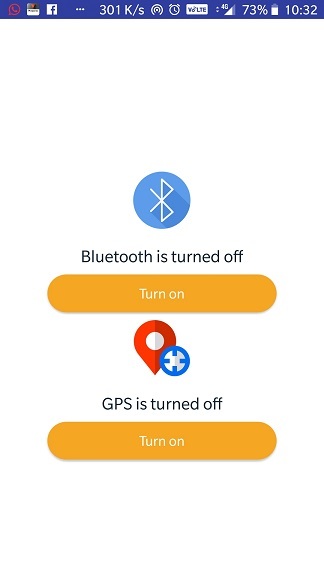 Step 5: The App will ask you to turn ON the Bluetooth and GPS. 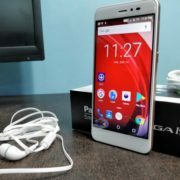 Tap on each option one by one to Turn them ON, however, if you don’t want the last location tracking then you can let the GPS turn off, as it will consume more battery of your smartphone. Step 6: Once the Bluetooth of your smartphone is ON. Now go to the Panasonic device ‘Seekit’ and press its button for 10 seconds until you receive a beep. Step 7: When the beep happened on the Seekit device; Tap on the Add Your Seekit option given in the Panasonic App. Step 8: When the device appears, tap on that to add or bind it with the app. Step 9: After the above step you will see the device settings, you can change the name of the device, Ringing alert mode, Category ( to easily remember to assign the default or custom category to device helpful in case of multiple devices); Buzzing time and Ringtone here. However, these settings can be changed later too by tapping on the connected device icon. Step 10: Once the device added you will see the connected sign. To edit the settings of the device, tap on the Cog or Gear icon. 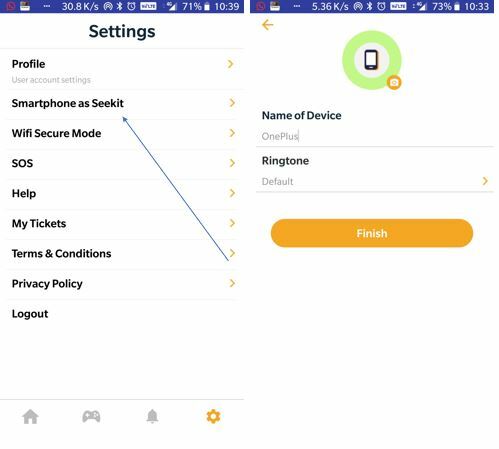 Step 10: To use the smartphone as Seekit tap on the option Smartphone as Seekit. 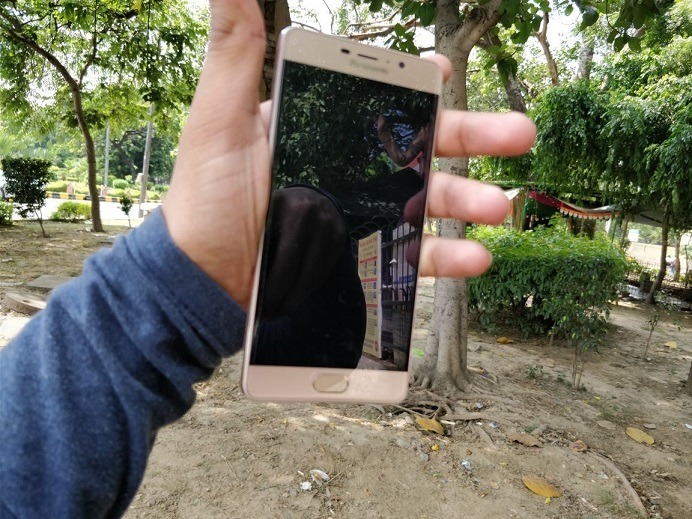 This option will allow users to find their smartphone using the this tracking device. You can change the Ringtone for the phone here which will ring when you will try to find it. 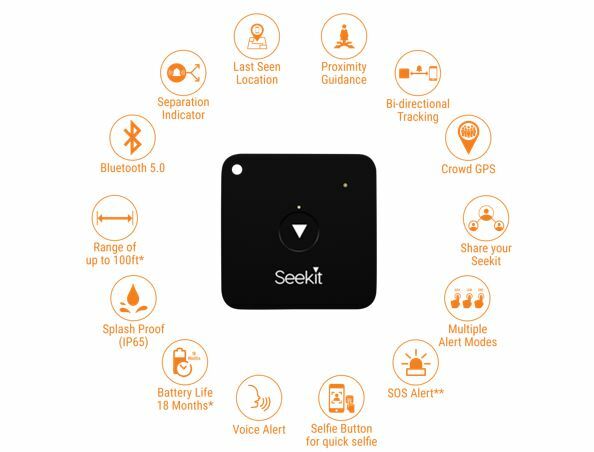 Step 11: To track the smartphone using this Seekit device just press its button two times and your smartphone will start buzzing. 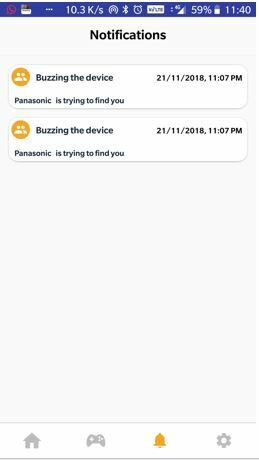 Here, I tried to locate my phone by buzzing it and that’s notification shown how many times did the Panasonic-tracker try to buzz the smartphone. 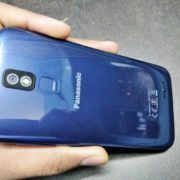 Step 12: In case, the user wants to find his valuable item that carries this Panasonic Seekit in it, then simply from the app’s interface tap on the connected device icon. 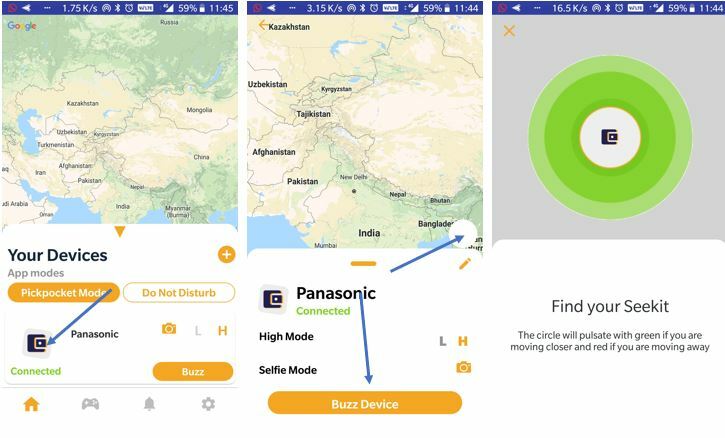 If you think the device carried item is nearby to you then you can simply tap on the Buzz Device option which triggers the buzzing sound in the tracker that helps you to find it. 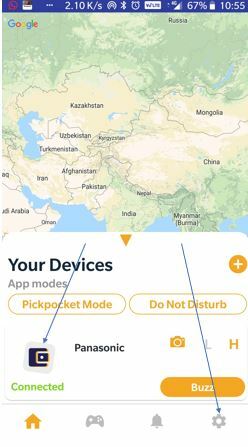 However, if you are not in the exact vicinity of the device or item where it is; then tap on the circle button given on the right of the app as shown in the below screenshot. And the app will start tracking it. The indicating circle will pulse with green if you are moving closer to your belongings and red if you are moving away. Step 13: Furthermore, to save the battery and hassle of hearing a buzzing sound inside your own safe location such as home, you can assign your WiFi to the app. This will prevent the device to notify you of disconnections. 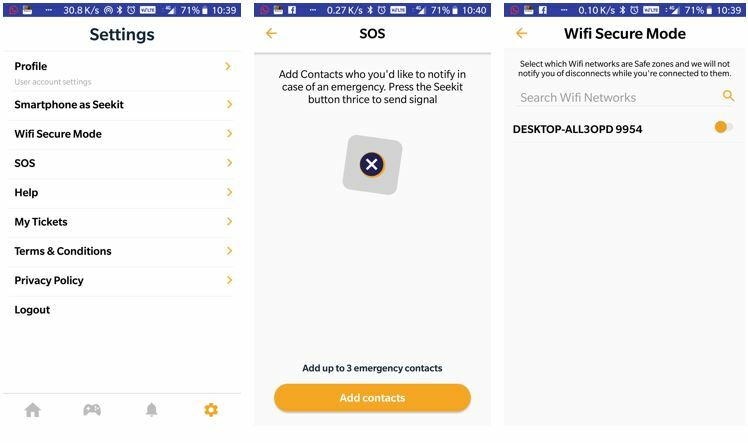 For children and women safety, they can add the three contacts to the app whom they can send the SOS signal (along with coordinates) in case of emergency by pressing the Seekit button thrice. So, it was the brief guide to use this app, if you have any questions in mind regarding its working, let us know, the comment section is all yours! !